This is my last post in my series of Best Therapeutic Toys per grade level. I hope you have found the posts helpful in shedding some light as to what toys are great for children with special needs. Through the years, I have been asked by families all over the country who I have worked with in the past as well as work with presently, “What can I purchase to help my child?” After thousands of inquiries, I decided to feature this topic on my blog so as to share the information with as many families as possible. In fact, I have many families still contact me from years ago to let me know how my recommendations impacted their child and family in addition to how well their child has also been doing and continues to progress at a speed they never thought possible. I entered into the education field because I truly wanted to make a positive difference for children and their families. I am always interested in finding ways to go above and beyond in order to help a child to be successful on their journey. We all come into this world with a plan that has been designed for each of us. For the child with special needs, that plan is different but I believe not impossible. Your child needs you to guide them, advocate for them, understand them and most importantly, love them. With each step you take, the goal is never lost and therefore what your child can accomplish is beyond anyone’s expectations with some help. As the saying goes: It takes a village. My hope is that my blog posts are MY part of the village to help your child soar! These are great for kids as you can do so much with them. What can you do, you ask? You can stretch it, roll it, bounce it and the list goes on and on. This is a great sensory toy for kids as well as adults that have tactile issues. And did I mention, it is great for relieving stress. 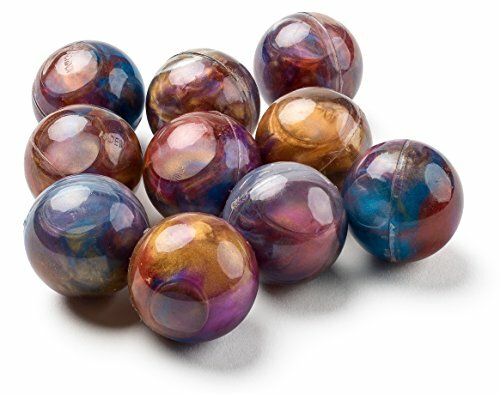 This toy is very portable and the set includes 12 balls so your child can share them with other kids in the family as well as friends. Each silly putty ball has it’s own plastic storage ball to keep it clean. 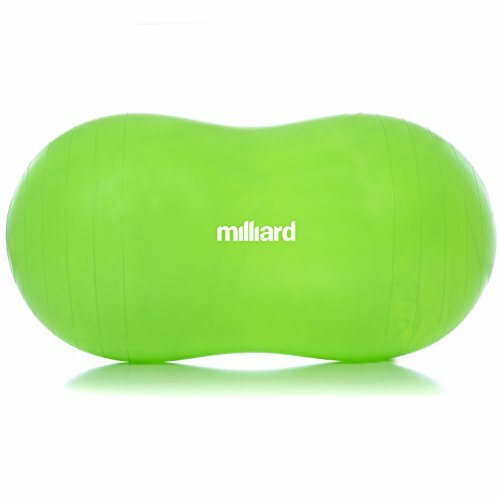 This blue ball is great for kids that have coordination and balance issues. It does have to be inflated by an adult once you receive it. It is also made from heavy duty vinyl so you can wipe it down to clean it. I love the blue color as it is happy and bright. The shape is cool too as it is in the shape of a peanut. This game is great for kids who need to increase their coping skills. There are 90 questions and the game is meant for 2 to 6 players. The cards are very colorful as the pictures are bright and inviting. The writing on each card is very clear and easy to read as well. 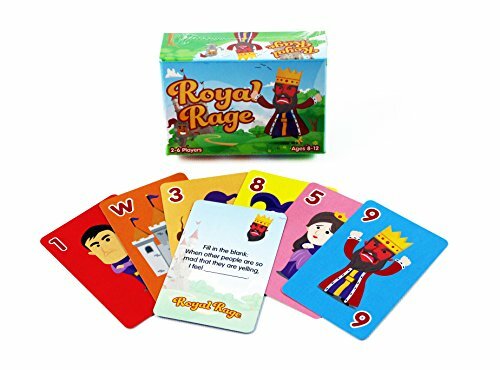 The goal in playing this game is to teach children how to react and respond to anger but in a healthy approach and way. This is a skill that should always be worked on as it is part of one’s life skills. This card game is great because it provides a prompt that then the child needs to fill in. The game is a great tool to gain insight as to feelings that the child has but has difficulty expressing. There are 35 animated cards in the box and the pictures are so cute, non-intimidating and very inviting to illicit an appropriate response. 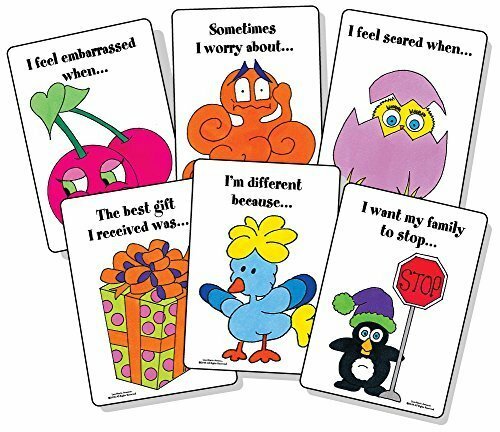 The goal is that the characters on each card help the child work through different issues. Some issues can include anger, anxiety, fears, family loss, etc. This toy was named winner of Dr. Toy Best Products and Dr. Toy 10 Best Socially Responsible Products. 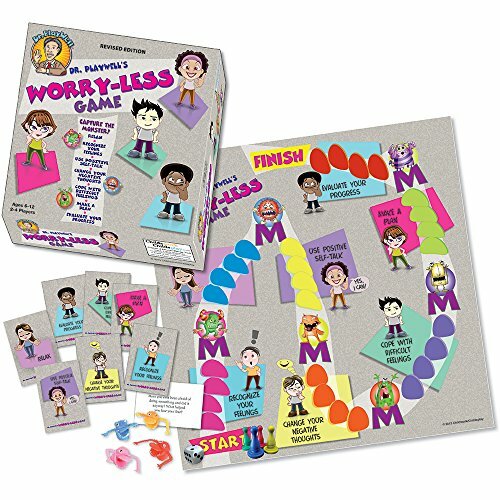 This game is so much fun- the goal is to catch the Worry-Less Monster. For special needs children, worrying might be part of their everyday. This game is meant to help with the negative feelings, anxiety, etc. as well as how to self monitor so the worry does not take over their day and therefore impinge upon their productivity. From the box to the game board to the cards - they are all colorful, fun to look at and super inviting. The characters are adorable and children will want to play this game again and again due to how it presents itself and all the while it will be help them beyond what they could ever imagine.